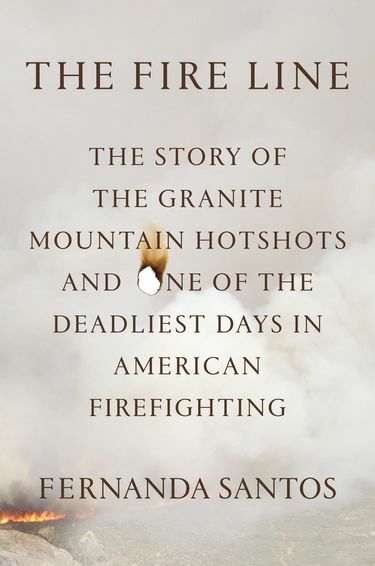 Fernanda Santos’ compelling new book, “The Fire Line,” tells the tragic story of the Granite Mountain Hotshots, 19 firefighters who perished in a 2013 Arizona wildfire. Santos will discuss her book Monday, July 18, at Third Place Books in Lake Forest Park. Fires, like wars, often fit a pattern in their telling. Introduce the men, map out the terrain, explain the enemy, tell what went wrong and bury the dead. Fernanda Santos takes this logical storytelling foundation and uses her deep reporting and clear writing to build a compelling story of how 19 firefighters died on June 30, 2013, in the Yarnell Hill Fire near Prescott, Ariz. The men in “The Fire Line: The Story of the Granite Mountain Hotshots and One of the Deadliest Days in American Firefighting” (Flatiron Books, 257 pp., $25.99) are mostly young, former high-school athletes, many of them military veterans, four college grads, seven who dropped out and eight who never started. The author of “The Fire Line” will appear at 7 p.m. Monday, July 18, at Third Place Books in Lake Forest Park; free (206-366-3333 or thirdplacebooks.com). At their memorial service, Darrell Willis, chief of the Prescott Fire Department Wildland Division and their boss, praised them for their bravery, loyalty, professionalism, fitness, work ethic and teamwork. But this time, things went wrong. At first the lightning-sparked fire hid from spotters as it smoldered on a mountain above Yarnell, a town of 638 people 43 miles from Prescott. Firefighting started late, loads of fire retardant were dumped in the wrong places or didn’t show up at all, communication with the hotshots was poor and then the wind started playing with the fire. Downdraft winds, clearly and succinctly explained by Santos, pushed the fire in an unexpected direction and across the hotshots’ escape route. Fire and heat swept through the dry chaparral around them, with temperatures reaching 2,000 degrees. The men deployed their fire shelters, and died within them. Santos, who as Phoenix bureau chief for The New York Times covered this story, is a smart-enough writer and reporter to know that some events are best told with spare language, stating what happened and letting readers’ emotions flow from there. There will be outrage when Santos recounts the feelings of the families upon hearing on radio or TV about their loved ones’ deaths. (Some media did not honor fire officials’ request that families be notified before the men were identified.) There is sadness in Santos’ descriptions of the memorial services and funerals. The logistics of firefighting take up much of the book, which makes clear that fires in the West are a near-constant occurrence, and the effort to fight them has become a sprawling enterprise. A National Fuel Moisture Database keeps track of the odds of ignition (90 percent for brush in sunlight around Yarnell at the time of the fire). The United States now has 85 meteorologists to assign to individual fires. Most of the Granite Mountain Hotshots did not qualify for employee benefits, and some families sued for compensation after the men’s deaths. Many of the men worked for minimum wages. They wished for what could be fatal to them — more fires — and the overtime needed to support their families. The increasingly dry forests and wild lands of the West are likely to fulfill these wishes of future firefighters, and more books following the war and fire pattern are sure to follow.